As spring wanes into summer, I find myself once again contemplating the absolute absurdity of allergies. 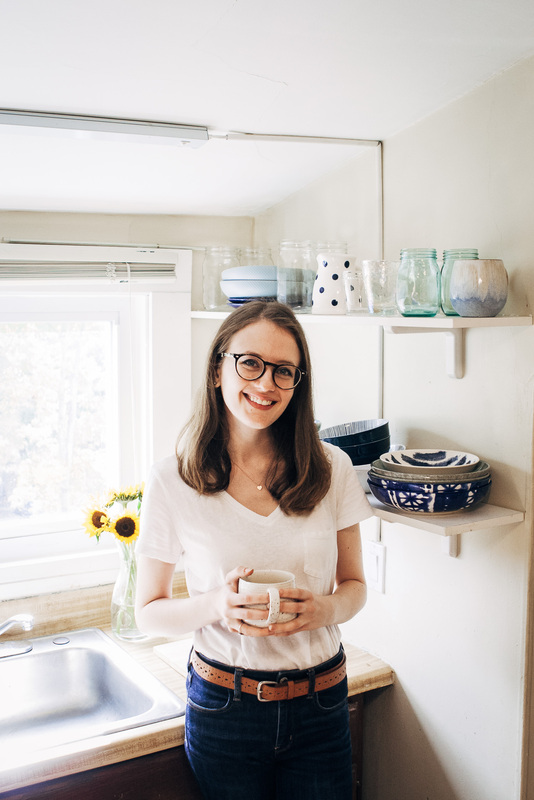 I wrote about this last year, and I’m still not over it – WHY are seasonal allergies a thing? WHY would our bodies have developed to be allergic to our PLANET?! Right now I feel like an alien who’s landed on planet earth and can’t breathe the air (at least without sneezing). Oh spring, I love you, but you’re terrible for me and my sinuses. Alright, rant over. 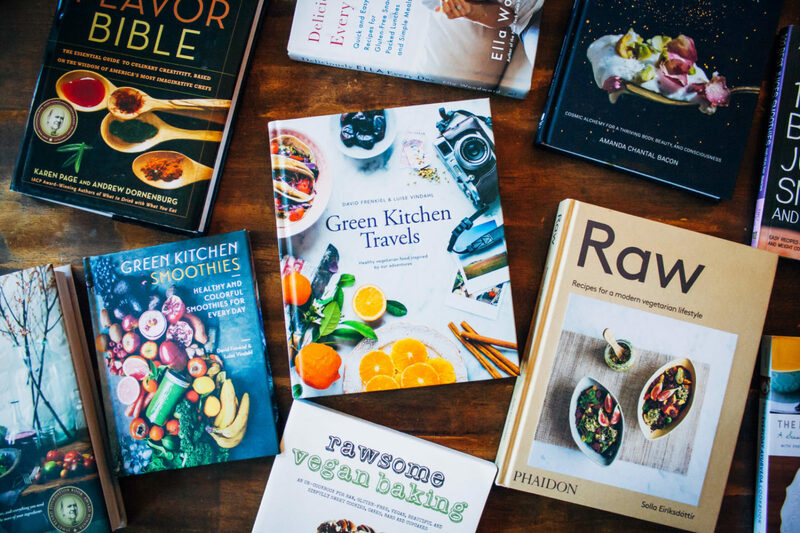 Let’s talk about food. Today’s recipe is one I made a few weeks back, before my doctor told me I couldn’t eat any raw vegetables. A restriction which, I hope, will be ending soon. But I wanted to make something that really embodied the good aspects of spring – bright flavors, fresh herbs, and vibrantly green colors. 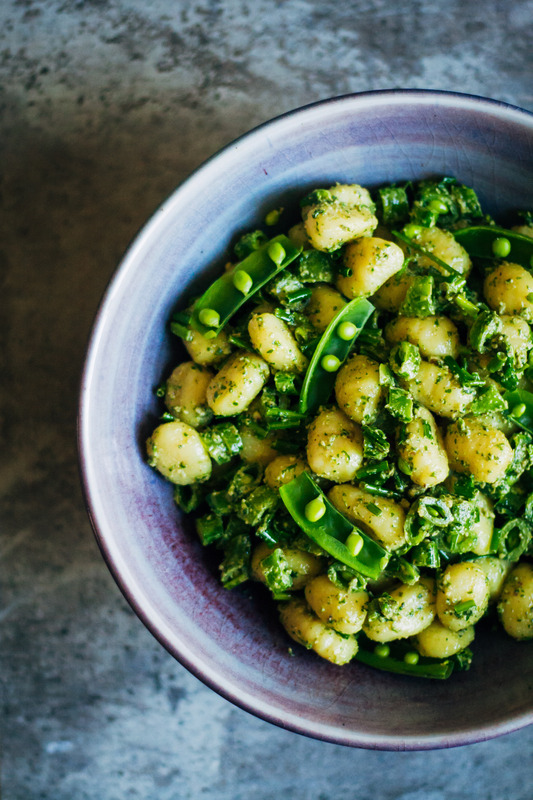 This spring gnocchi is the result of that inspiration. It’s super simple, delicious, healthy, and takes only 20 minutes to throw together. You can thank the gnocchi for this – it’s one of the fastest cooking pseudopastas out there. I used this brand of gnocchi, which takes only two minutes to cook. Talk about fast! And they come out super fluffy and pillowy, tasting like little clouds of potato + flour goodness. I know y’all are going to love this recipe! 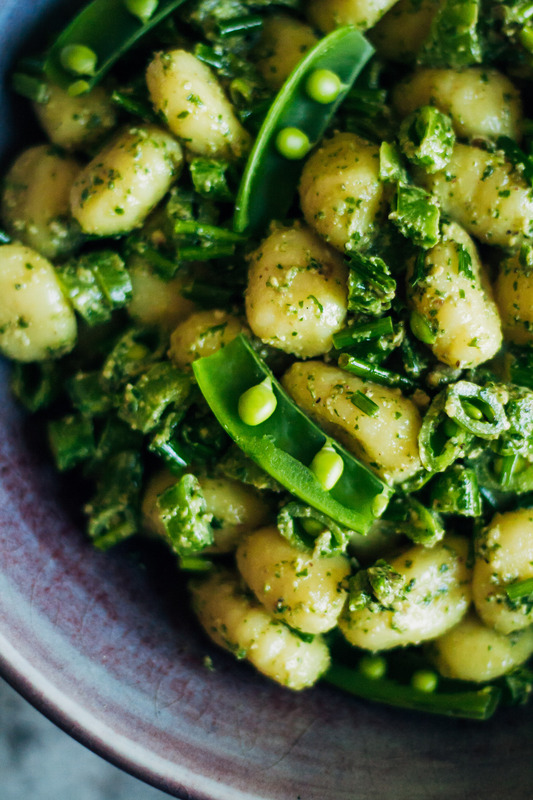 This spring gnocchi is full of fresh, herby flavors, and couldn't be easier to make - taking only 20 minutes from start to finish. Start by cooking the gnocchi according to the package's instructions. When done, drain and set aside. Next, make the pesto. Add the walnuts to the food processor and process until they're broken up into smaller chunks. Then, add the rest of the pesto ingredients and process until smooth but still slightly chunky. 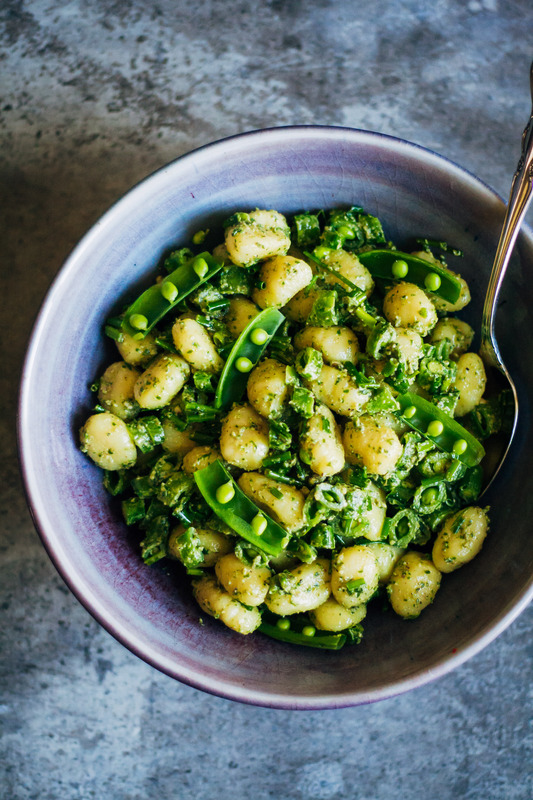 In a bowl, mix gnocchi, pesto, chopped chives, and chopped snow/snap peas. Mix well until the pesto is evenly distributed. If desired, garnish with halved peas (optional). 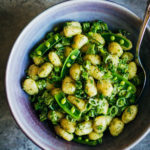 i hope you are able to get off the restrictions soon :( my boyfriend is the same way with allergies, and some days are horrible.. i have not had gnocchi in forever, this is a lovely inspiration. Gnocchi is seriously mi Achilles heel. Don’t do this to me! Haha well gnocchi IS super delish! Oh be still my gnocchi loving heart. I seriously LOVE this flavor combo Sarah, the musardy-ness of the pesto and the soft and starchy goodness of the potatoes. Yep, it’s love. 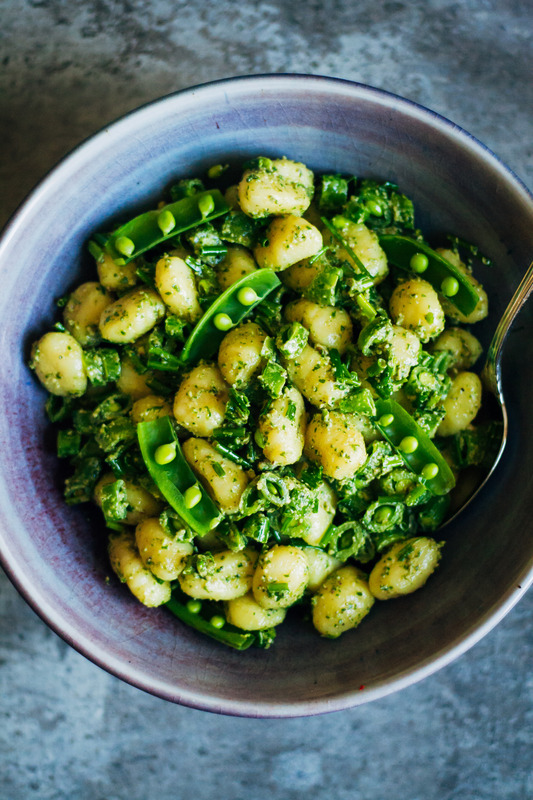 I always picture gnocchi and a cold weather, heart warming dish, but this looks fresh and light and perfect for spring! I just made this for dinner tonight. It is fabulous, and I didn’t even put in the chives because I didn’t have them. 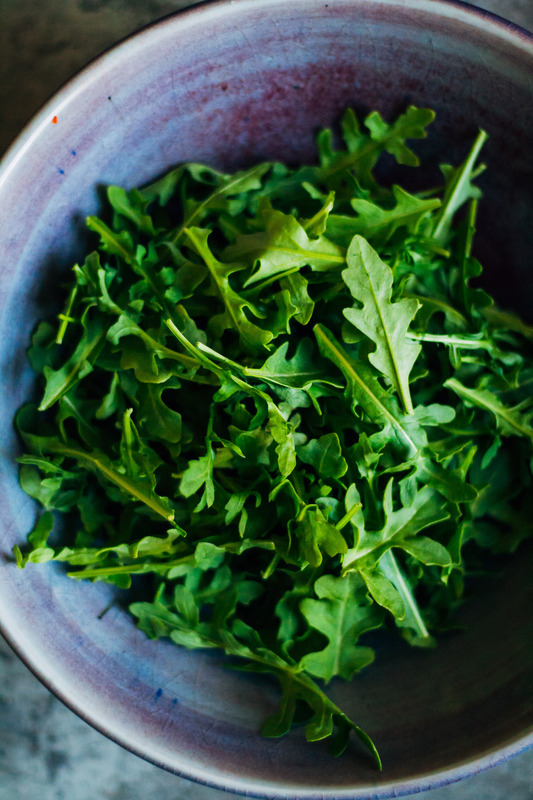 I am a huge fan of arugula–it’s one of my favorite foods and I’m so thrilled I found yet another way to use it. Thank you! This looks delicious! I’ve only made one recipe with gnocchi, but 1 lb. ended up making 4 servings, so I’m surprised to see this recipe only making 2 servings with an equal amount of gnocchi.